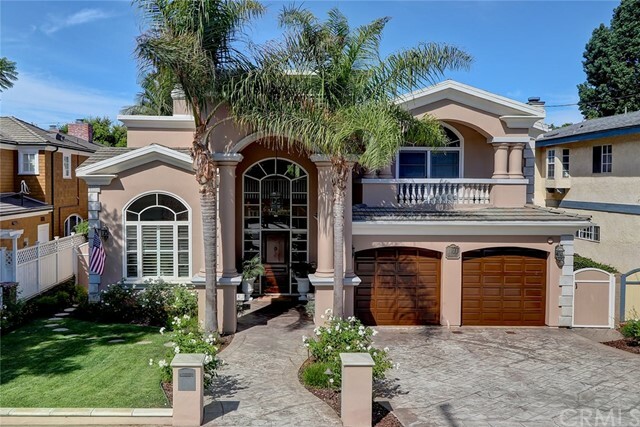 Welcome home to 1721 Elm Avenue in the exclusive Tree Section of Manhattan Beach! Plenty of parking with a spacious driveway and 3 car garage. 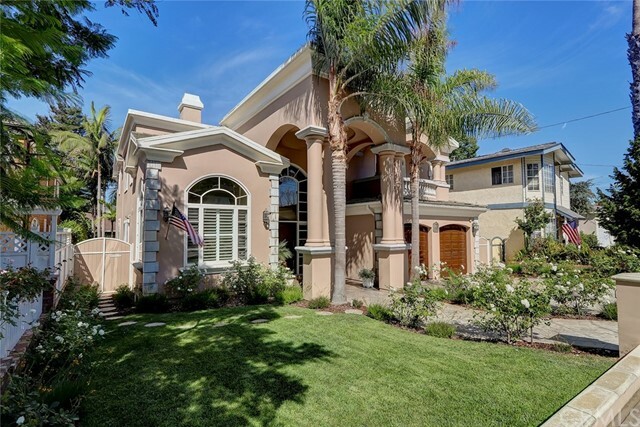 Beautifully manicured and spacious front yard perfect for family outdoor play! 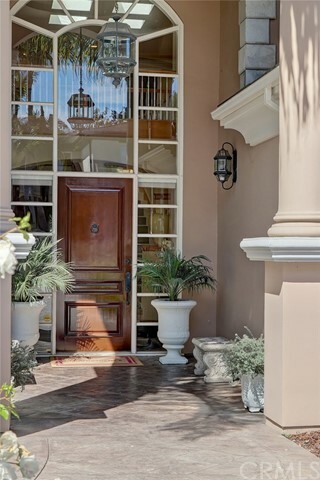 Exquisite and grand 60' frontage sets this estate sized home apart from the rest. 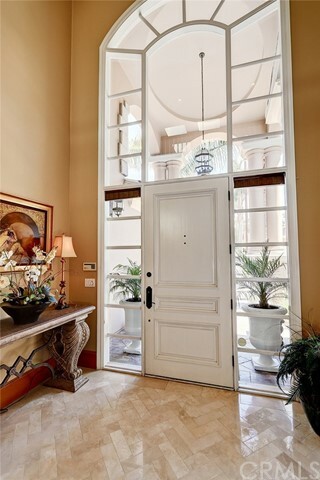 Extravagant entry with lots of character and elegance. 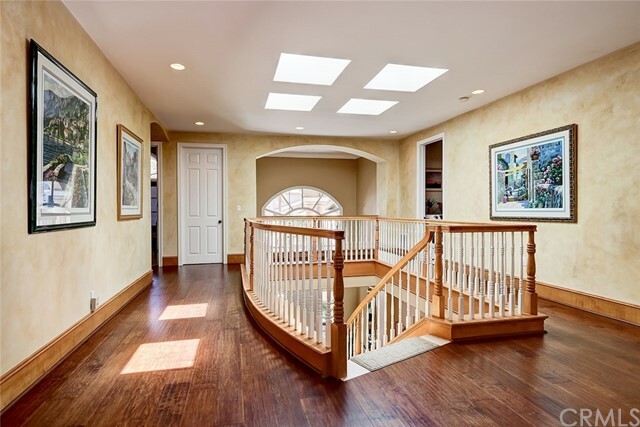 The plethora of windows and two story ceilings make the grand entry light, bright and a welcoming space. 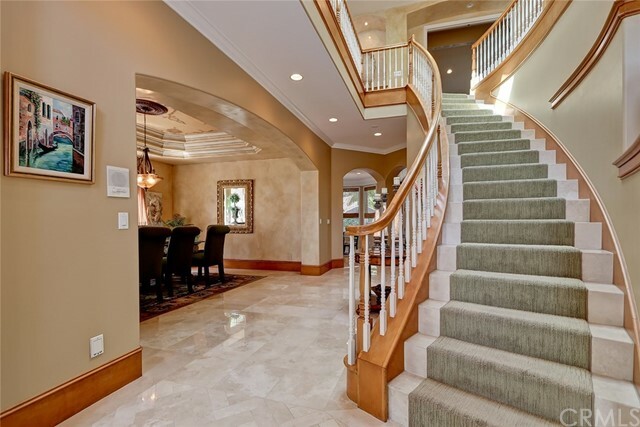 The sweeping staircase directly across from the front entrance lets you know you have 'arrived'! 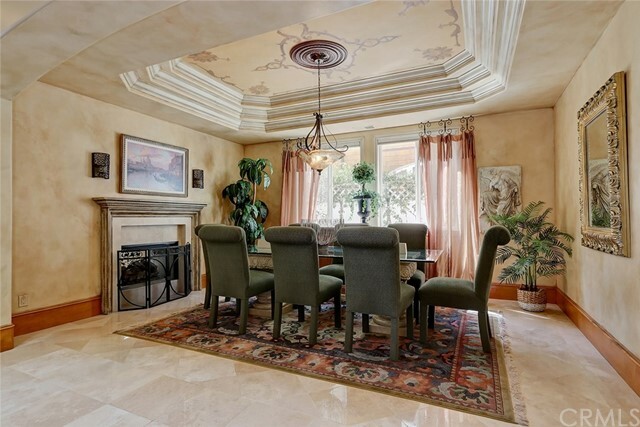 Adjacent of the grand entry is a salon style formal living room perfect for entertaining. 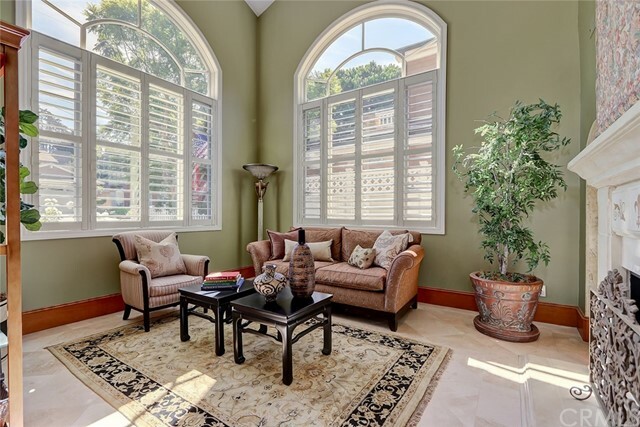 Light, bright and spacious formal living room with custom plantation window treatments. 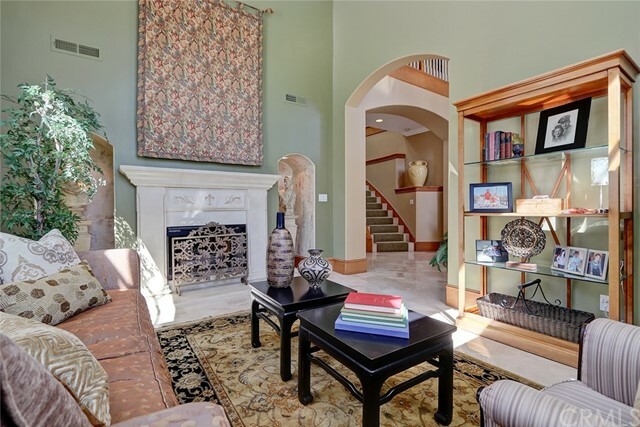 The two story ceilings and double-sided fireplace set this sitting area apart from the rest! The double-sided fireplace leads into the extra deep formal dining room. 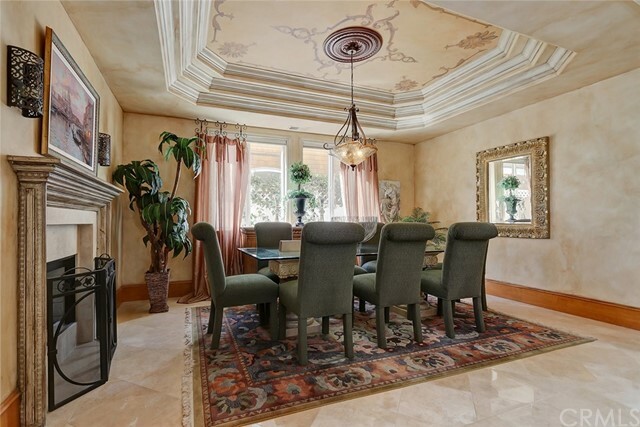 The coved and hand painted ceiling gives the formal dining room a level of sophistication and elegance. Travertine flooring throughout formal dining room along with custom wide plank baseboards. 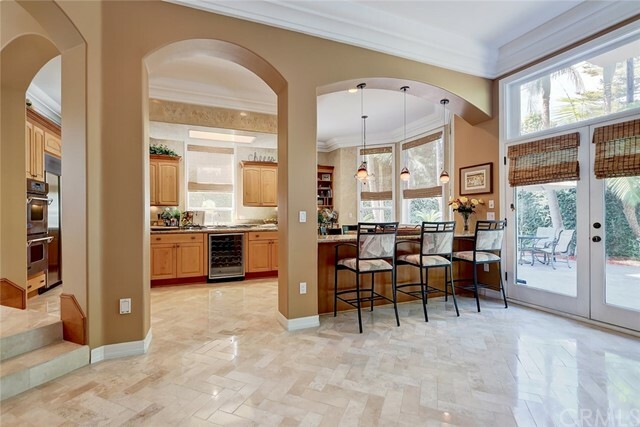 A large arched entryway leads you from the formal dining room to the expansive gourmet chef's kitchen. Multiple arched entryway details and separate breakfast nook make for a seamless entertaining to the backyard. 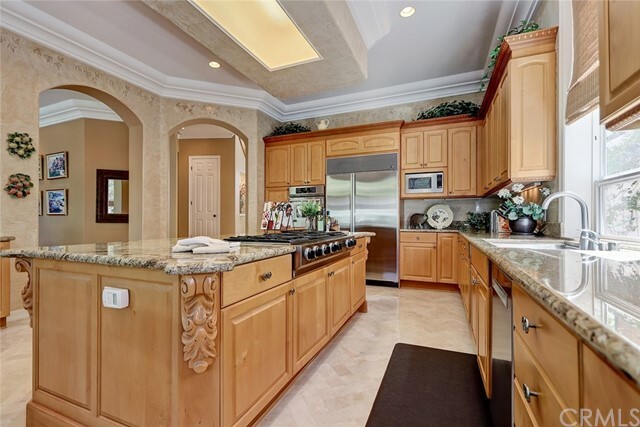 The chef's kitchen comes equipped with stainless steel double ovens, large Sub-Zero refrigerator, and expansive center island that includes a 6 burner countertop stove and wine refrigerator. 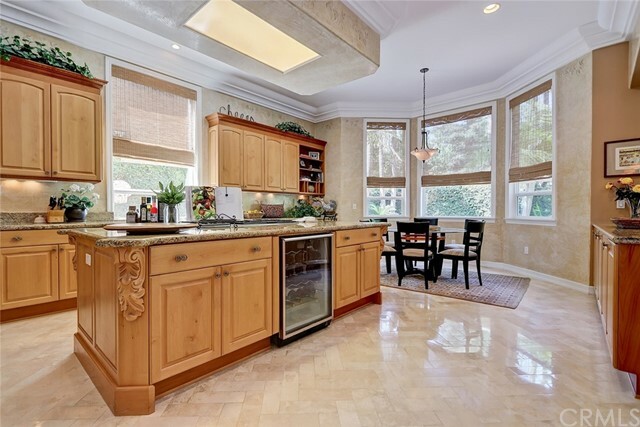 Granite countertops throughout kitchen along with unique Travertine Herringbone design floor. 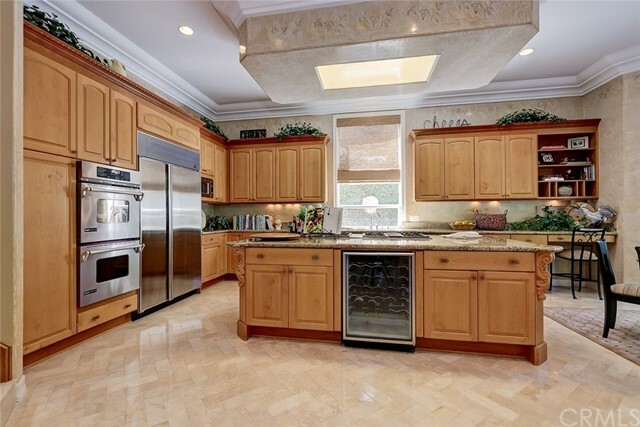 Stunning solid wood cabinets with intricate corbels and custom Venetian plaster painted walls. 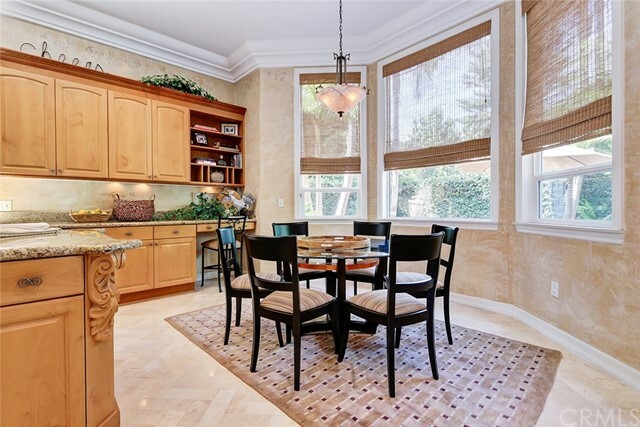 Breakfast nook with lots of natural light and custom window treatments. 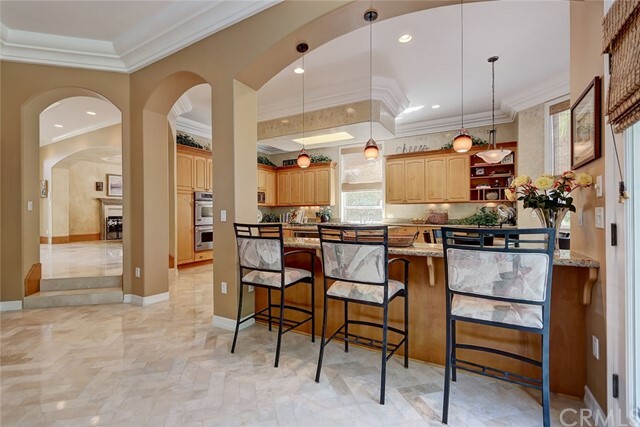 The open floor plan has a spacious family room adjacent to kitchen. Travertine flooring, crown molding, and recessed lighting throughout family room. 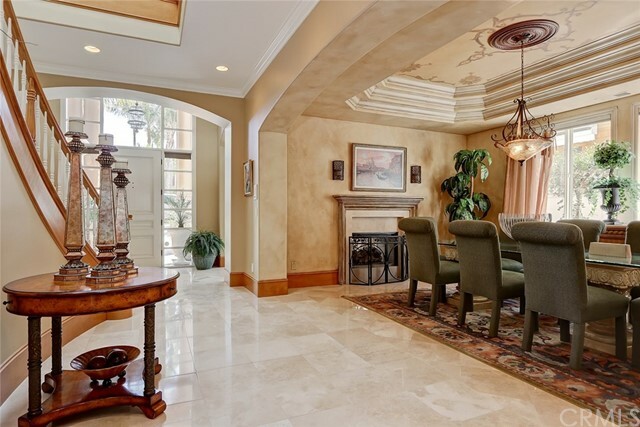 Cozy up in the family room with this elegant fireplace surrounded by marble. Large French doors lead from the living room to a private backyard and patio. A versatile ensuite bedroom with a full bathroom and walk-in closet located on the main floor. Ensuite bathroom on main floor has a combo shower/tub with stone inlay. 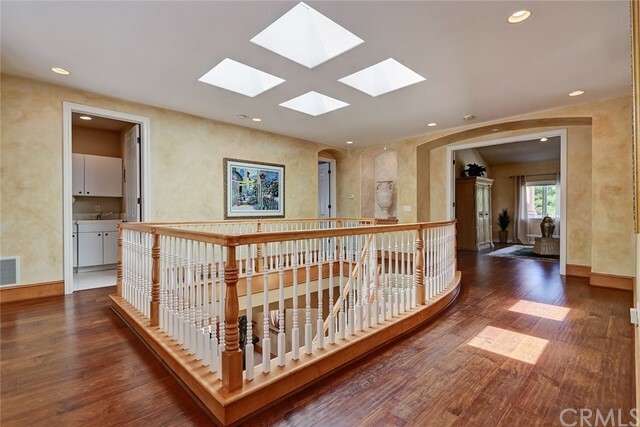 Second floor landing with hardwood floors and 4 skylights allowing for lots of natural light. Separate laundry room located on second floor adjacent to upstairs bedrooms. 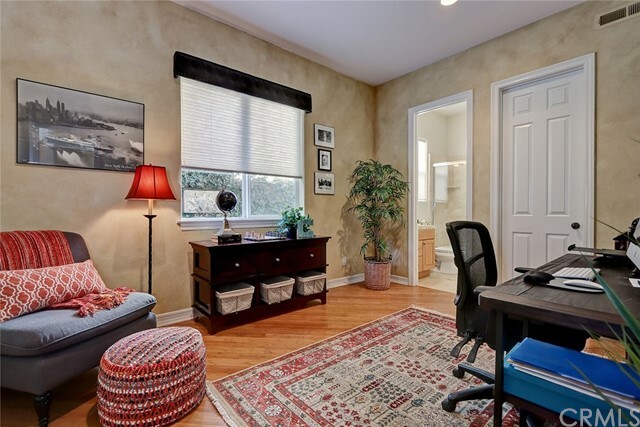 Spectacular oversized master suite includes romantic fireplace, hardwood floors, and French doors leading to a private balcony overlooking the backyard. Quint sitting area within master bedroom with arched ceilings and recessed lighting. Adjacent expansive walk-in closet with additional access to master bathroom. 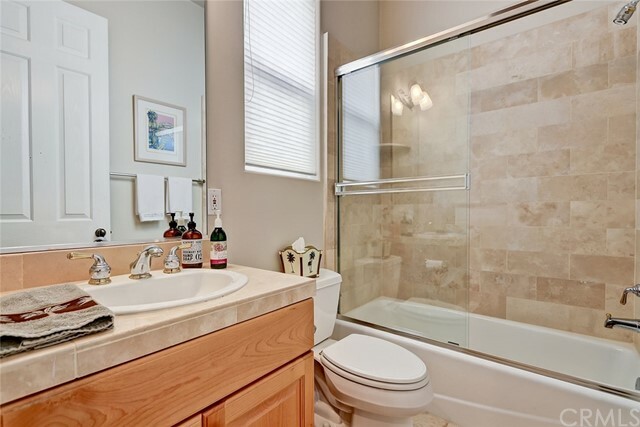 Master bath with large built-in vanity, his & her sinks and separate glass enclosed shower. Custom plantation window treatments and large spa tub make this master bath a relaxing and calming space. Oversized walk-in master bedroom closet with custom built-in cabinets. Quaint guest bedroom with large mirrored closet doors and recessed lighting. Ensuite private full bathroom with shower/tub combo. 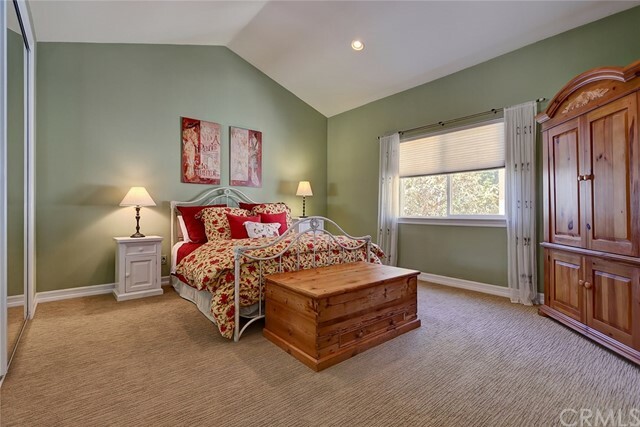 Spacious, bright and light guest bedroom with private balcony overlooking the front yard. Jack-and-Jill bathroom includes clean white tile countertops and private toilet room with tub/shower combo. Fifth bedroom with custom window treatment and recessed lighting. Large backyard patio with plenty of room to entertain. Bubbling water fountain and night lighting complete this resort style backyard. Extremely private oversized landscaped and hardscaped backyard.